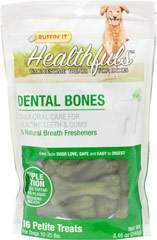 From the Manufacturer: Ruffin' It's ™ Healthfuls™ Dental Hygiene Kit provides everything you need to improve and maintain your dog's oral health. Veterinarians agree that periodontal disease is more common in dogs than in humans. Brushing 2 to 3 times a week can help prevent gum disease in dogs according to the Veterinary Oral Health Council. Chicken Flavored Toothpaste your dog will love! Unique Double Ended Dog Toothbrush for all mouth sizes. Finger Brush to gently reach in to sensitive areas.